What is the measure of $\angle AOC$? A circle with center O is inscribed in a quadrilateral ABCD. AB// CD, $\angle BCD$ = 60 and $\angle ADC$ = 40. What is the measure of $\angle$ AOC ? I have no idea how to proceed from here. I drew this diagram. 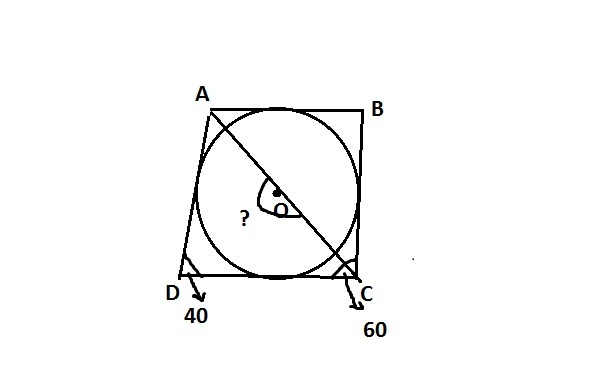 Answer of this problem: 140. I assume that the center of the inscribed circle fits on the bisectors of the two given angles. Seriously? The way you have drawn this AOC is a straight line. Is that correct? Draw a radius from $\displaystyle O$ to $\displaystyle AD$ hitting at point $\displaystyle X$. Draw a radius from $\displaystyle O$ to $\displaystyle DC$ hitting at point $\displaystyle Y$. Then $\displaystyle \angle XOY=140$. No idea what $\displaystyle \angle AOC$ is. The diagram makes no sense. CD should be approximately 6 times longer than AB! Then, with E and F on CD, draw perpendiculars AE and BF. Resulting triangles BCF = 30-60-90 and ADE = 40-50-90. Then easily shown that angleAOC = 140. As AB$\parallel$CD, $\small\angle$DAB = 180$^\circ$ - 40$^\circ$ = 140$^\circ$. $\small\angle$AOC = 360$^\circ$ - 140$^\circ$/2 - 120$^\circ$ - 60$^\circ$/2 = 140$^\circ$. CD is about 4.76 times as long as AB. Why you always ready to hate my writing? Agree with ~4.76, Skip: my eyeballing faulty this am! VERY sorry. I should have said "the diagram is not to scale".